I often feel that SWTOR doesn't get enough credit for its open world content. I would never claim that it's the game's main selling point or that other MMOs don't offer more in that area, but if you listen to some people you would think that there is absolutely no reason for you to simply explore and enjoy the game's environments... but there is! As an example of this, I really love all the named champion mobs that are scattered around the world. Often they won't drop anything interesting and only very few of them will give you a codex entry, but to me it's interesting enough just to find them. Why is this guy so much stronger than all the other mobs around him? Does his name tell me anything interesting? Am I strong enough to take him down on my own? There's just something intriguing about these mobs, and many of them offer a good challenge if you fight them at level. Last night Pet Tank and I were making our way to Corellia to work on the main quest line that introduces the Seeker Droid mechanic. 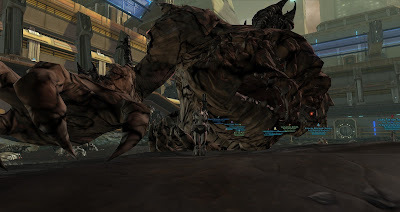 We were supposed to search Coronet Zoo, which had undergone some visible changes with the 2.0 patch - the most surprising of which was the fact that a ginormous rancor with the unassuming name "Lucky" was ambling around the area now. We weren't quite sure how to classify him. We hadn't heard anything about there being any new world bosses on Corellia, but he had over seven million hitpoints - more than many operations bosses - so he wasn't clearly just another champion mob. Figuring that we were pretty invincible as a tank/healer duo (/cough), we attacked. We shaved off about 200k of his health (less than three percent) before he managed to flatten us. We were promptly rewarded for our failure by receiving a new codex entry and title: "Unlucky". Hah! That immediately raised an obvious question of course: if we did manage to kill him, would that make us "Lucky"? The notion was proposed to other guildies who were online at the time, and they too were interested in finding out. The fight took something like ten minutes and was actually pretty boring in terms of mechanics. Personally I was still really happy to have been there though, because for me it was all about the experience of discovering this boss unexpectedly and then finding that there was more to him than met the eye. He didn't drop anything too exciting, but we did all get "Lucky". And now that I've written this post, with that title, I wish that I had thought of recording the fight and then making a video out of it to the tune of this song. The extra fun is he actually spams that big red text to everyone on the planet while you're engaging him. I was wondering whether I had bugged out a quest somehow on my Agent (who was wrapping up Chapter 3 on the planet at the time). You're absolutely right about the exploration part of the game being underestimated. Poking around and trying to solo odd stuff remains a source of joy for me, too. I guess I see it from the 'glass half empty' perspective - there isn't quite enough serendipity and randomness in the world. I do enjoy the oddly placed champion challenge, but I can't recall a time when I was genuinely surprised by something in the open world. I like the random unguarded chests on Balmorra I found though.